After being rumored for quite some time, Apple has recently sent out invites for an upcoming special event set to go down on October 27 at 10AM PST. 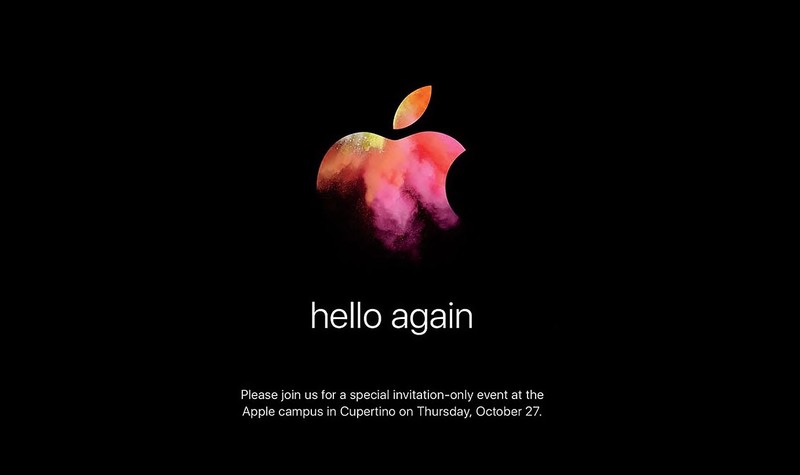 As usual for Apple, the invite itself is cryptically titled “hello again” which appears to be a reference to the original Mac which launched with the word “hello” on its screen. Apple is expected to reveal an entire host of new Mac products as a lack of innovation in the area has caused Apple PC shipment declines of over 13% in 3Q2016. Chief among the expected new products is a complete redesign of the 13.3″ and 15.3″ MacBook Pro which hasn’t seen changes in over 4 years. According to previous rumors, the upcoming MacBook Pro will feature a new OLED touch strip above the keyboard which will replace the function keys, USB Type-C ports, Touch ID fingerprint scanner, and on higher end MacBook Pros, AMD Polaris GPUs. Unfortunately, it’s unlikely that the new MacBook Pro will carry Intel’s new 7th Generation Kaby Lake processors. Rumors have also suggested that Apple could be refreshing their 13.3″ MacBook Air, refreshing the iMac and introducing a new 5K Cinema Display. Mac Pro could also see some new internal hardware, but a full redesign is unlikely. The 12″ MacBook is unlikely to be refreshed as well given that it was recently redesigned earlier this year. As usual, Apple will be live-streaming the event, so if you’re in the market for a new Mac, be sure to mark it on your calendars!